The truth is…I hate dying Easter Eggs. I mean, I love getting creative and doing something with my kids that I did when I was little. But I hate breaking out a half dozen cups–or mason jars–full of vinegar and hot water just to dye something I have to cram back into the fridge and never get to really appreciate. Modern food safety is such a drag. ~This post is sponsored by EggMazing, who sent us a free egg decorator to test out! My opinions are my own. The post also contains affiliate links which may reward me in the event of a sale. I use these funds to restock my glitter supply. By the way… if you’re dead set to dye some hard boiled Easter eggs, then you have to use my favorite old school dye method. The last couple Easters we’ve focused on making “keepsake” eggs, generally out of paper craft eggs or chalkboard eggs. So when I got an EggMazing egg decorator, that was the first thing we tested! 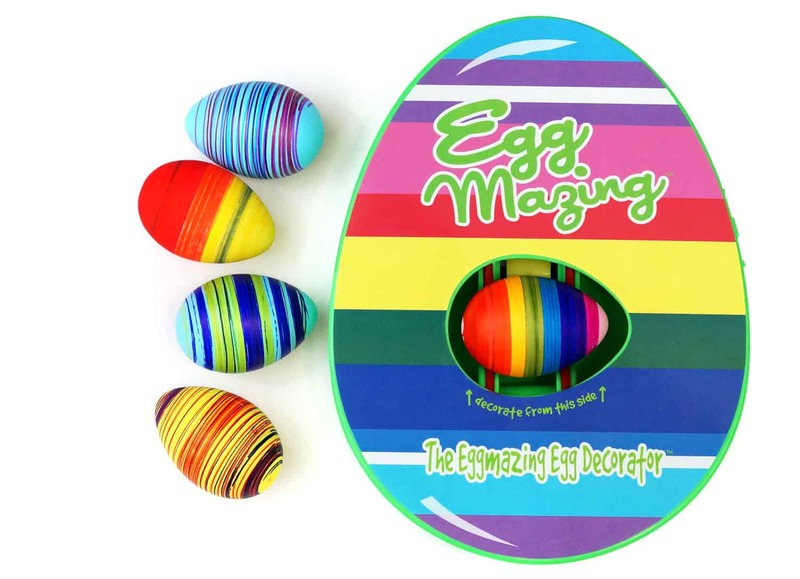 The EggMazing Egg Decorator is a sort of egg lathe. 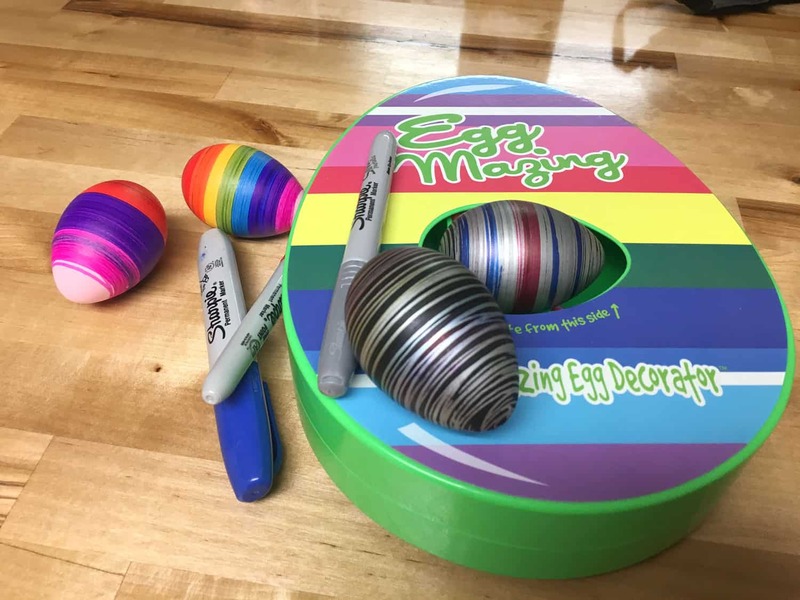 I mean, you don’t carve it up like wood, but the gizmo spins the egg between a set of wheels so you can quickly and easily decorate it with a marker. You can make stripes, squiggles, rainbow eggs–or just color in the whole thing! Mitch was decorating an egg within seconds of popping the EggMazing out of the box…on the living couch! Since it uses markers there’s seriously no mess. None. Nada. 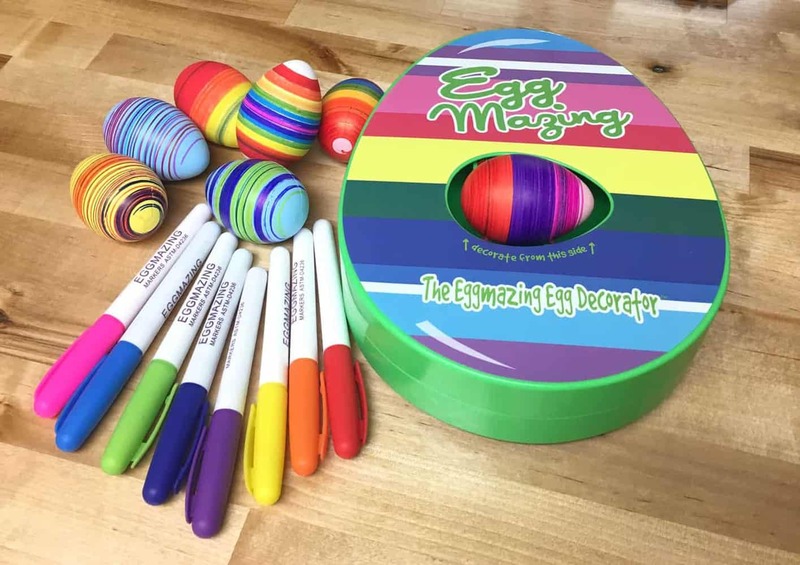 The EggMazing comes with 8 non-toxic markers in a rainbow of colors. These markers are quick to dry, which is part of the secret! You can substitute any other permanent marker if you like. Or pick up replacement markers at the EggMazing website. Whatever you do, don’t use water based markers! They won’t dry quickly and you’ll end up with a smudgy mess. Speaking of mess, you will need to wipe down the wheels if you’re fussy about a clean pattern. The wheels are rubber, so it’s real easy to wipe them with a bit of rubbing alcohol on a cotton ball. You can see on the video below that I forgot to wipe the wheels down before Mitch started a new egg. In the middle, I clean the wheels up and presto! Good as new! Here’s a slightly more professional video with real eggs from the EggMazing people. You can find the EggMazing at some stores, at the EggMazing website or over at Amazon. Want more ideas for egg decorating? Here’s 21!